IBM InfoSphere MDM is a master data management software that allows users to have full control over every aspect of their critical enterprise data, regardless of the system or model. The software sends the information to the users’ application and makes it readily available to the end users, all in a unified and reliable view. InfoSphere MDM coordinates and managers user’s information the entire data lifecycle using a highly modifiable framework that works with hybrid cloud environments. This results in better collaboration and innovation between business and IT users based on trusted master data. IBM InfoSphere MDM comes with inbuilt domain patterns that support a variety of business sectors and industries. Advanced features such as agile self-service access, analytical graph-based exploration, and governance and dashboard functionalities further enhances your MDM strategies and options. The user-interface is quite intuitive and easy to use, which greatly helps in simplifying you interpret your data. All the information you need to access is in the dashboard, which also speeds up all your data management processes. There is a cloud-based version of the software that allows users you to develop and scale MDM solutions without shelling a significant amount of money. IBM MDM on Cloud edition is offered as a subscription-based product and offers you an intelligent approach to developing an MDM solution. With InfoSphere MDM, your master data is delivered in near real-time throughout your whole organization without any loss of accuracy. This is a useful functionality for registry or virtual style implementations, which offer quick time-to-value. With master data readily and easily available, InfoSphere MDM greatly improves your ability to innovate. It empowers line of business users to work in close collaboration with others, explore critical entities, attain new insights, determine possible threats, and innovate. If you are interested in InfoSphere MDM it could also be beneficial to investigate other subcategories of Best Product Information Management - PIM listed in our base of B2B software reviews. Each enterprise has different needs and requires an application that can be customized for their size, kind of employees and buyers, and the particular industry they are in. For these reasons, no software can proffer perfect features off-the-shelf. When you search a software app, first be sure what you need it for. Read some InfoSphere MDM reviews and ask yourself do you need basic features or do you require complex tools? Are there any industry-specific tools that you are seeking? Get the answers to these questions to aid your search. There are multiple aspects that you need to mull over and these include your finances, particular business wants, your organization size, integration needs etc. Take your time, try out a few free trials, and finally zero in on the app that offers all that you require to improve your company competence and productivity. How Much Does InfoSphere MDM Cost? Contact IBM to know more about InfoSphere MDM, including basic and enterprise pricing packages. You can also launch an interactive demo to see if the software is a perfect fit for your business. We realize that when you make a decision to buy Product Information Management - PIM it’s important not only to see how experts evaluate it in their reviews, but also to find out if the real people and companies that buy it are actually satisfied with the product. That’s why we’ve created our behavior-based Customer Satisfaction Algorithm™ that gathers customer reviews, comments and InfoSphere MDM reviews across a wide range of social media sites. The data is then presented in an easy to digest form showing how many people had positive and negative experience with InfoSphere MDM. With that information at hand you should be equipped to make an informed buying decision that you won’t regret. 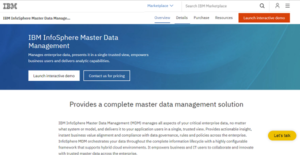 What are InfoSphere MDM pricing details? What integrations are available for InfoSphere MDM?